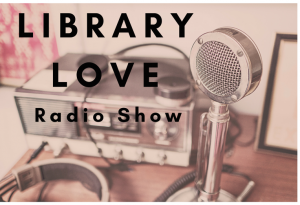 The following is an excerpt from the December, 2018 “Library Love” radio show podcast, hosted by WOUB’s Conversations with Studio B. *Updated info has been added. Becca (ACPL Communications Officer, show host): Recently there’s been some concerns and rumors about empty shelves. Do you want to address that topic right off the bat? Nick (ACPL Director): One reason shelves appeared so full before was because they were filled with books that weren’t circulating. That may have been because the information was outdated, or because the book was unappealing due to damage, or any number of other reasons. Once we cleared those items out of the way, the shelves appear empty because the books that are coming in to replace them are actually checking out…And librarians’ first response when someone says they can’t find something should always be to ask “What was it you’re looking for?,” because it’s rare that we can’t get the book that person wants. Heather (ACPL Access Services Coordinator): To add to this, shipments of new materials come in almost daily. I believe we have received over 20 boxes of new stuff just this week! If patrons are seeing “empty shelves,” it’s due to upcoming renovations–like in Nelsonville this winter– and/or the materials are checked out. Which is such a good problem to have! Becca: Well, how many books are we purchasing per year, compared to other things like video games or eBooks?—so we’re talking physical books. Heather: We added 26,926 books in 2018—that’s for all age groups. Becca: Do you imagine that we’ll ever go mostly, or even all digital? Or are we going to keep these physical books? Heather: I don’t ever see us going mostly digital. Because we are part of the Ohio Digital Library, we share our e-resources with libraries all over Ohio, which gives us the ability to continue putting our primary focus on print material. We also still see a huge demand for print materials. Around 2013 or 2014, eBook use actually plateaued, not just in libraries, but across the industry, and what I think is happening is that eBooks are filling a particular niche. They’re convenient for people who want to bring a large number of books with them but don’t want to have to pack the physical books, etc. But for classics, for nonfiction titles, for all sorts of other things, nothing will ever replace the physical book. It’s too convenient a package, it’s too efficient , and it’s too affordable. Becca: Right, and libraries are really important to communities because of those physical books at your fingertips for free. Taryn (ACPL Youth Services Coordinator): Including for young people—which you might not think! But Millennials love libraries, and they prefer physical books, so they’re not going away. 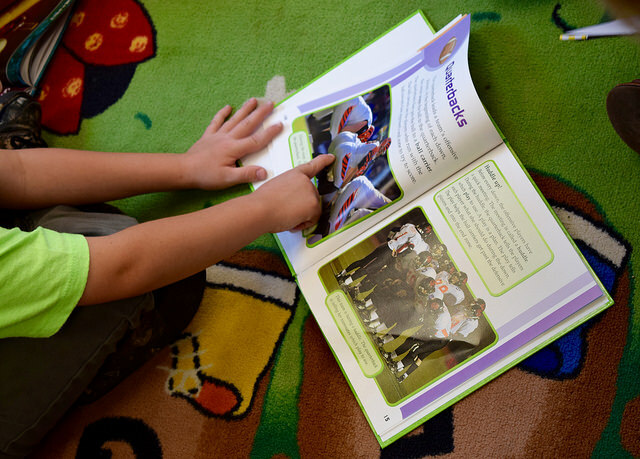 Becca: I discovered a book last year on our shelves that I absolutely loved–a physical book. But this year, I’m listening to it right now as an audiobook, and it is a different experience. It brings the book to life in a new way having both options. Nick: And that’s a really good point, too, that the way we consume information generally is going to vary, not just from person to person, but even for ourselves, depending on what our needs are at the time. We as the county library system, are trying to provide those different experiences for our patrons. Becca: Well, that leads into my next question. When we’re ordering materials for the libraries, do we have a particular audience or age group in mind? Heather: We definitely purchase with each library community in mind [Nelsonville, The Plains, Glouster, Coolville, Albany, Athens, and Glouster], but we certainly do not cater to any specific crowd or age group. Becca: So besides having outdated info, what are some other reasons we might need to replace a book or remove a book from a library shelf? Heather: As part of what I like to call routine maintenance, we assess every item for damage—if the book is missing pages, if a book has a broken spine or food stains. A book with a lot of damage usually means that it’s been well read, that people liked it, so we’ll make it a point to replace those items if we can. Water damage specifically can cause mold, which can spread to other items on a shelf, so we try to keep up on that especially. But any type of damaged item has to be assessed. Becca: So what if I’m in a library in Athens County, and I’m feeling disappointed that there isn’t a book that I really wanted to find at that library. What steps can I take to get that book? Heather: You can look to see if another library location has it. You can submit a purchase request. We’re also part of the Serving Every Ohioan Consortium, so we can pull in books from all over Ohio. It’s very, very rare that we can’t get the book that you’re interested in. Have questions or concerns about our collection? Can’t find a book? Please let us know! We are here to help. Director Tepe’s email, phone, and office are always open to library patrons! Listen to the whole radio show from December, 2018 by visiting this link. 2017 Summer at the Library Songwriting Workshops with Megan Bee! Another great summer of writing original songs together with workshop leader, Megan Bee! Because of Richard and Karen Harvey’s most recent donation to ACPL, the youngest library users in Coolville have a flurry of brand new books from which to choose! 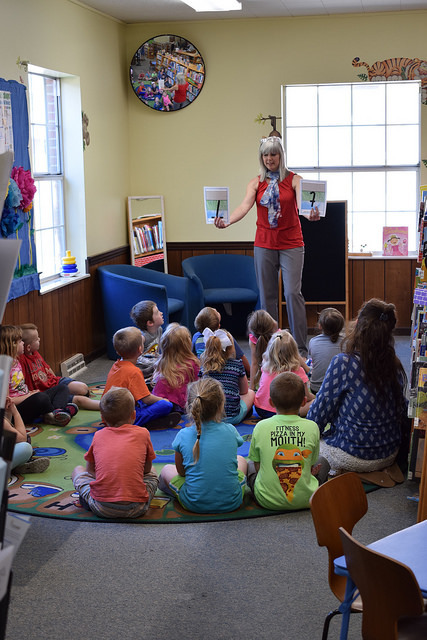 And choosing was no easy task on May 16 when the library hosted a celebration storytime with the new books displayed within easy reach. The Harveys and Coolville Elementary School’s principal attended as special guests. Coolville library staff spent months collecting popular topics and noting annual school projects that would benefit from updated library materials. After gleaning additional feedback from local teachers, they carefully selected which books to order. Hocking Valley Bank added a further donation to help update and build the Coolville children’s collection. Our sincerest thanks to both the bank staff and to the Harveys! Every donation makes a difference. Want to know more? Visit https://www.myacpl.org/donate/. 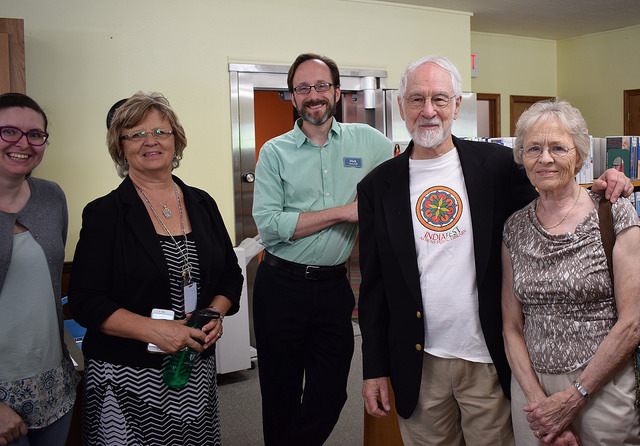 More photos from the May 16 celebration in Coolville can be found on ACPL’s Flickr page. All ACPL branches are made better and brighter by our many volunteers! From shelving and labeling books to planting flowers, every action makes an impact! “Thanks to Chauncey regular Amy Farnsworth, the garden strip on the north side of the building looks even better! 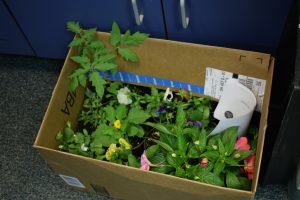 Amy recently spent an afternoon clearing out the overgrown garden strip along the north side of the building and replanting it with perennials from her home garden. We’re hoping that Amy and her son will continue working with us through the gardening season. Proof that some of our volunteers have been with us for a while! 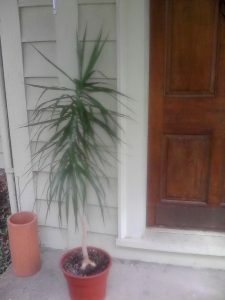 This volunteer thank you plant used to be just as tiny as those in the box. Find out how you can volunteer at your local library at https://www.myacpl.org/volunteer/. Our new seasonal radio show (hosted by ACPL staff + a special community partner guest) fills you in on what’s coming up at your local library and across the county. 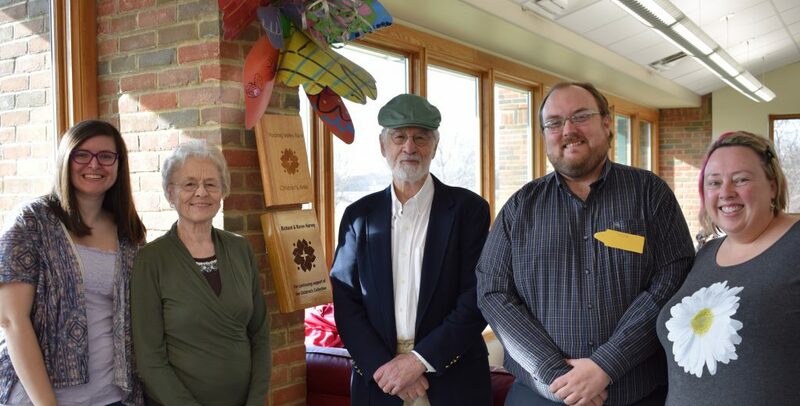 The Harveys pose with ACPL staff in front of their plaque in the Athens Public Library children’s area. As these same babies grow, they will eventually be able to explore books about the world, individual countries, states, and STEAM and other educational topics, in part because of the generosity of Richard and Karen Harvey, who were honored in a small February 21st, 2017 thank you ceremony. 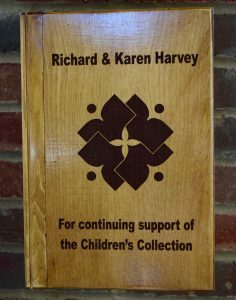 The Harveys have made several donations over the years to help support and grow the current children’s collection. Look for a new batch of books in Athens made possible through the Harvey’s latest donation sometime in April 2017. 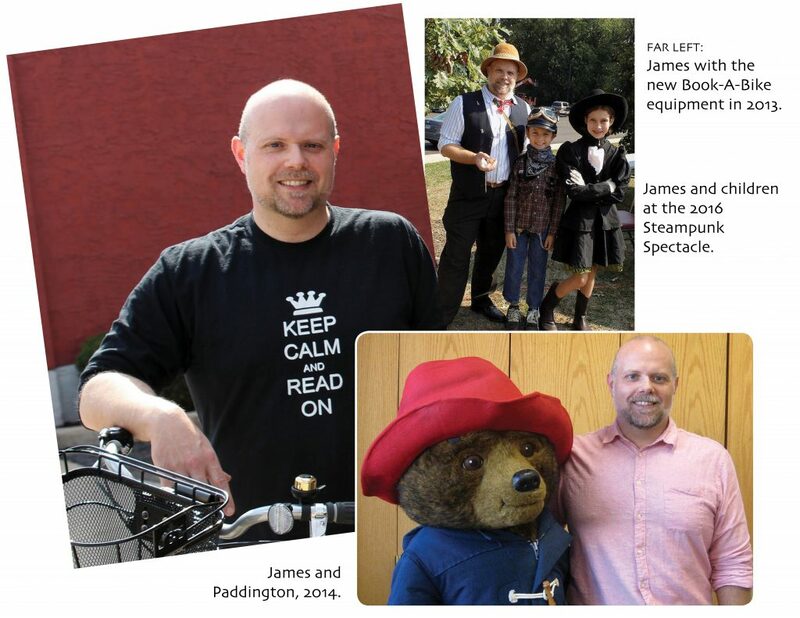 When asked what they’d like to share with young ACPL library patrons and their families if they could, the Harveys stressed both the life-altering importance and fun of reading. “In a world with so many screens, I would ask adults to encourage children to enjoy and benefit from books,” Karen Harvey said. Richard Harvey added that he’d tell a room full of youngsters to “Find a book that, while reading it, it moves you to read another one, just to keep the ball rolling, keep it rolling!” We couldn’t agree more. Stay tuned for other exciting ACPL projects made possible by the Harvey’s vision and generosity, including in Coolville! Other photos of the ceremony can be found on ACPL’s Flickr page. 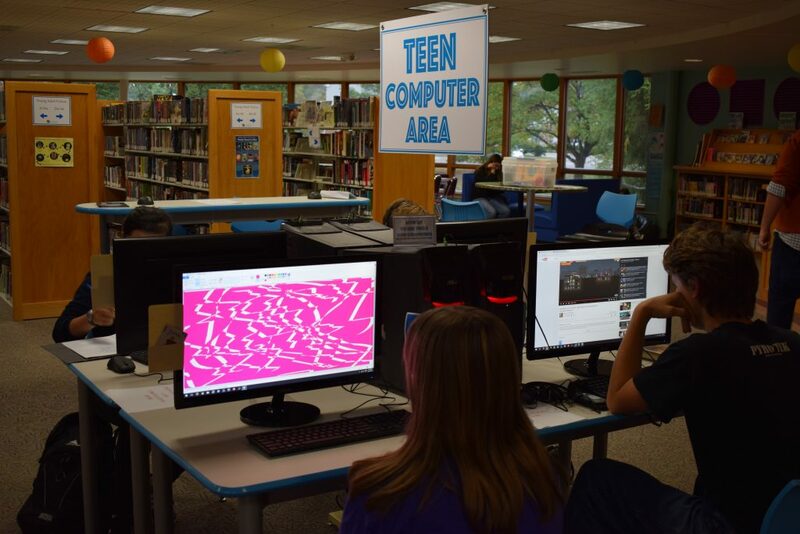 Athens County teens are a unique and vibrant part of our library communities. 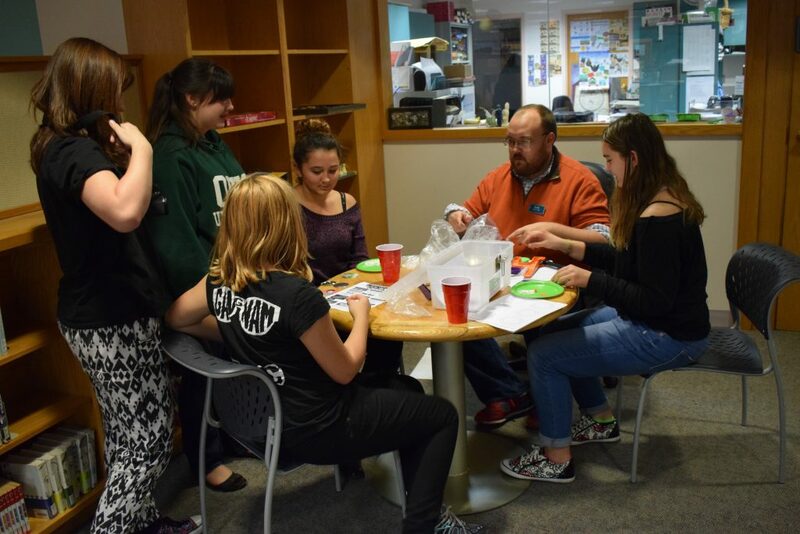 Monthly “Teen Stuff” and online calendars sum up all the programs and projects we host just for this age group, and many of our branches now have designated spaces where teens can gather. Below, ACPL’s Luke Bentley shares about his passion for working with teens and describes the newly revamped Teen Area in Athens, which hosted a grand opening celebration Oct. 25. ACPL: What made you want to work in libraries and with teens? Luke: My background is in education, particularly teaching in grades 7-12…What’s great about working in libraries is that I’m still involved in educating and enriching people’s lives, but there are no limits as to what I can do. If someone has a great idea, I can work toward making that happen to the best of my ability. I also think that teens are often under-appreciated by adults, and underrepresented throughout society… I like to take teens seriously, because they deserve to be taken seriously. Why are you celebrating and revamping this space at the Athens Public Library? 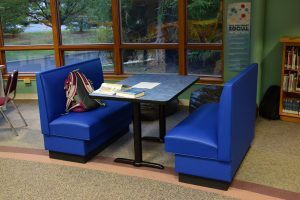 I wanted to make the changes in our Teen Space because, to put it simply, I didn’t think it worked as well as it could when it came to welcoming teens and making them comfortable. I want teens from all over Athens County to know that if they need a sanctuary, or if they just need a place that they can come and be themselves, that this is that space. Luke demonstrates how to make buttons at the Teen Area grand opening. What are some highlights teens can expect from the space? 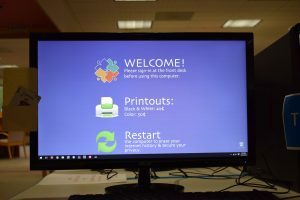 The central feature is our set of four, top-of-the-line computers that are reserved specifically for people in grades 7-12. These computers will not only be reserved for usage for teens for most of the day, but they will also be equipped with the Adobe Creative Cloud, a suite of digital creation programs including Photoshop, Dreamweaver, Animate, and many other programs for image editing, video editing, audio editing, and more. You can also expect to be able to give your input on how you want the space to shift and change, and what you’d like to see displayed. 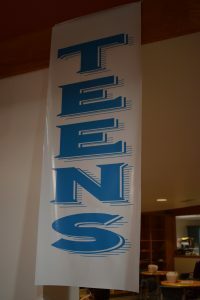 In a perfect world, what are some of your dream teen programs? In a world without limits, I would love to have regular programs where teens produce their own podcasts and YouTube videos, learn screenwriting and animation, or design their own video games and apps. I’d also love for teens to come to me and tell me what their passions are, and what kind of programs they themselves want to run here in the library, and I’d do whatever I could to help! Tell us about a memorable moment from a recent teen program. I visited Athens Middle School recently, and it was just fantastic to see all the teens who are so passionate about reading, and passionate about creating. I was walking through the halls after promoting our upcoming in-school program called Young Adult Book Club, and I overheard a group of students talking about how excited they were to come, and asking everyone else if they were coming. Of course, I look forward to making more memorable moments when YABC starts! What have Athens County teens taught YOU over the years? The teens that I’ve been able to interact with teach me not to put my own passions down. 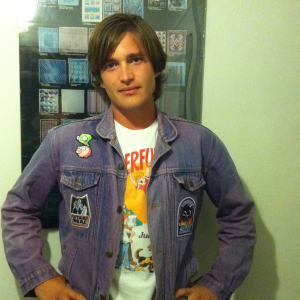 Teens wear everything on their sleeves; they love what they love and they aren’t ashamed. I think people could learn to embrace themselves a bit more. ACPL: Welcome, Connor! What made you interested in Americorps? Connor: Americorps’ Guiding Ohio Online program provides a wonderful cocktail of library experience and service to the community. I was extremely excited by the opportunity to help make a positive impression on the area while also getting to be associated with an organization that is already committed to serving the community. Where did you grow up, and what did you like most about it? I am a local to Athens County, having graduated from Athens High School in 2009. There is a plethora of fantastic features to our county, and I believe that one is the incredibly diverse amount of produce that can be harvested throughout the area. A trip to the farmers’ market can yield anything from jalapenos to pears, making for a revolving door of wonderful eats. What are some of your biggest interests? I have found myself growing more and more interested in the environment and how to best treat it with the love and care that it deserves. I suppose that the movie Silent Running left a lasting impression on me. What should patrons expect from Guiding Ohio Online this year? We are extremely lucky to have a library system that reaches from one end of the county to the other, and with the Guiding Ohio Online Program we are looking forward to being able to provide our services to all areas throughout Athens County. Our focus right now is on one-on-one tech help sessions. My goal is to visit each branch every week, and to assist as many patrons as possible. Although I am far from being a wordsmith, I do dabble in writing poetry. Beyond my own writing, though, I really enjoy seeing others read their work. It also seems that no matter how long you’ve lived in the area, spending time outside in the county’s natural beauty is perpetually entertaining. I like to spend my time outdoors hiking, kayaking, and playing tennis with my parents. I am absolutely in love with the original Star Wars movie and enjoy collecting fun and unique Star Wars memorabilia. Also, I am not afraid to admit that I like Wings way more than The Beatles. What’s the easiest way to reach you? I can be reached by email (technology@myacpl.org) and also via telephone (740-249-9422). A memorable highlight from Summer at the Library 2016 involved a large dose of teamwork, paired with rhyming skills, a guitar, and recording equipment. In just four hours over two days, young patrons at branches in Nelsonville, Athens, and Chauncey created three original tunes with the help of an expert, local musician Megan Bee. The libraries recently asked Megan to tell us more about her music and the summer songwriting workshops. Megan hopes to keep working with young musicians and with ACPL in the future, and is excited to share her own original music as she tours. Megan Bee with summer songwriting workshop participants. (ACPL) Tell us a little bit about yourself and how you came to teach songwriting. (Megan Bee) I have a background in environmental education. I have always loved teaching and working with kids.Â Then music came into my life.Â I had been co-writing with other songwriters and eventually decided to see if that process could work with a group of kids.Â For the past two years I have been writing with groups in summer camp settings with great results.Â This summer I was honored to work with local kids at the libraries. Is it true you asked participants to sign a “contract” at the beginning of each workshop? Tell us about this. 1. Be positive … Even if you don’t like someone’s idea, stay positive because that idea might help us get to a better idea.Â If we get negative, people start to close off, then the ideas can’t flow out. 2. Be creative… For the process to work, you have to speak up and share your ideas no matter how silly they might sound.Â If no one spoke up, we’d never have a song.Â You can’t just sit in the back and take notes. 3. Have fun…Songwriting is fun. It’s so inspiring to work with kids.Â When I go into a workshop I know by the end of the two hours we’ll have a song recorded.Â Sometimes I think that’s a crazy goal, but they have always come up with a song under the pressure.Â It’s great to see the words and ideas fly around the room, then come together at the last minute.Â I love those moments where everything clicks together.Â As a writer on my own, sometimes I have trouble getting started.Â The workshops remind me how fun and easy it can be, and how much I love working with groups where everyone’s ideas build together.